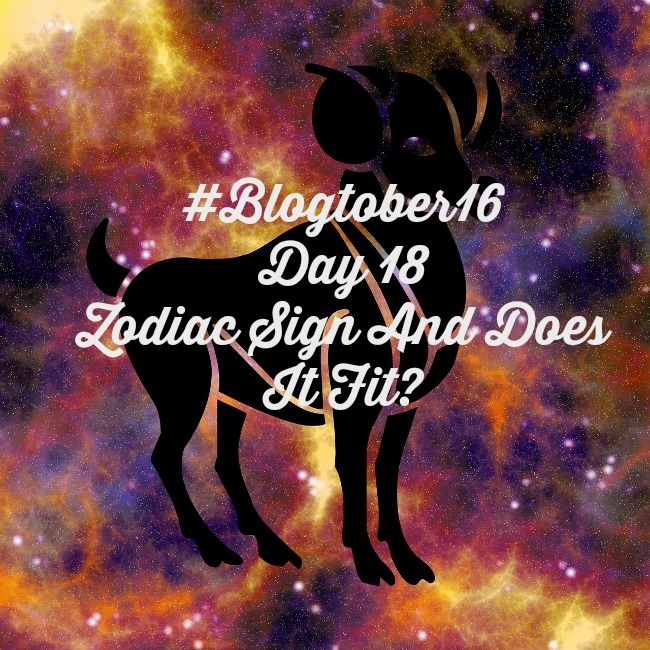 #Blogtober16 Day 18 Zodiac Sign And Does It Fit? Oh Yes! Ever since I was a little girl this was me to a tee. I'm an Aries. I was born in March. When I was little I spent ages checking my horoscope. What I was like, who I would marry, what was my lucky number. I believed it all. My sister is three years older than me and an Aries too. Her birthday is the day before mine. We are not alike in any way at all. She is a Pisces. She always looked at Pisces for her fortune although according to the stars she is an Arian too. Now I am older I never look at my horoscope, I believe it is all twaddle. I still believe I am true to my sign though. So what are Aries like? What am I like? I am all of the above. I am very impatient and hate queueing for anything. I am very moody and short tempered although as I have grown older I have mellowed. I am generous and my glass is always half full. Courageous? That depends on whether I am protecting my family or not. For them absolutely, nothing would stop me, but in truth I have many fears. Enthusiastic, impulsive and impatient that's me. I jump right in with both feet and start many projects but I have a short attention span, if I do not get results quickly then I walk away. That means I have a house full of unfinished projects. A born leader. Well I like to be in charge and have my own way, I get very frustrated at ditherers. Make a decision, do it. That's me. I'm on day 18 of this project and will I get to the end? Yes, because even if I get bored I will finish because Arians like a challenge and to win!